Keep surfaces in the home clean and uncluttered. Bare floors and walls are best, particularly in the bedroom where you spend one-third of your time. Hardwood flooring is best, but if you must have carpet, throw rugs that can be washed or low-pile carpets are better. Use washable curtains of cotton rather than heavy drapes. Replace horizontal blinds with roller type shades. Choose easy to clean furnishings such as leather, wood or metal. Remove items and ornaments that collect dust and store games, toys and stuffed toys in plastic bins. The single most important method is to put zippered allergen dust mite covers on all pillows, and mattresses. Encasing mattresses works better than air cleaners to reduce allergy symptoms. Every week, wash bedding, uncovered pillows and stuffed toys in hot water (130 degree F, 56 C) to kill mites. 3. Vacuum once or twice weekly. Keep in mind, though, that vacuuming will not get to dust mites deep in carpets and mattresses. Vacuuming also puts dust in the air. Use a vacuum with a HEPA filter. They’re specially made to trap particles as tiny as 0.3 microns—which means they’ll be able to capture most allergens. If you have allergies, wear a dust mask while doing housework or get someone who doesn’t have allergies to clean. Use a damp or microfiber cloth for dusting. Leave the house for several hours after cleaning it. 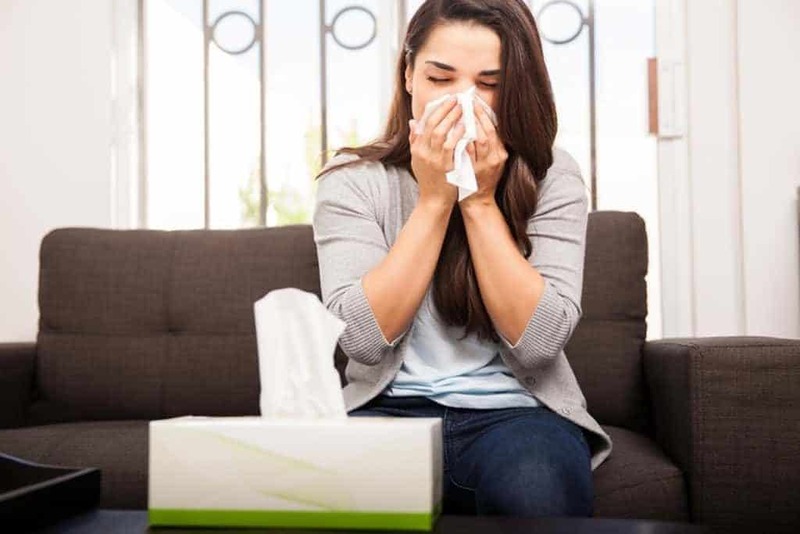 You can reduce the number of outdoor allergens such as pollen and mould from entering the home by keeping windows and doors closed and the air conditioner set on recirculate. Close windows and rely on air conditioning during pollen season. If your allergens are from indoor sources, open windows and allow the circulation of fresh air into the home. It is suggested that people allergic to animal dander not keep household pets with feathers or fur. If unable to find a new home for your pet, consider keeping them outside, weather permitting. Measure humidity in each room with a hygrometer. If above 50%, use a dehumidifier to reduce dampness, and clean it once a week. Install and use a vented exhaust fan to remove cooking fumes and reduce moisture. Most stove-top hoods simply filter cooking particulates without venting outside. Install and use an exhaust fan to reduce moisture while taking baths or showers. Vent your clothes dryer outside or line dry clothes. If your fans just re-circulate indoor air into the attic, mould can simple start growing there, vet to outside. Reduce moisture around the bathroom, kitchen, refrigerator and other water areas of the home. Dehumidifiers will help reduce both mould and dust mites. Fix all leaks and other causes of damp areas, plumbing, windows, foundations etc. Clean mouldy surfaces, especially bathrooms and dry off damp areas after each use. Rid the yard of mouldy firewood and piles of leaves and weeds. Limit to a few indoor house plants. Remove wallpaper and install tiles or paint walls. 9. Consider a Room Air Filter. Just be aware that they have limitations. They can capture airborne allergens but can’t trap anything that’s settled in rugs or furniture, which is where most allergens sit. Still, they can be effective, particularly if you’re bothered by pollen. Make sure the one you buy doesn’t produce ozone, a gas that’s extremely irritating to people with allergies. HEPA filters are best and most useful in small areas such as a bedroom. Avoid use of wood-burning fireplaces or stoves because smoke and gases can worsen respiratory allergies. Most natural gas fireplaces won’t cause this problem. Don’t allow smoking in or around the house.